Former U.S. Secretary of State and Nobel Peace Prize winner Henry Kissinger will visit Greenwich Friday to offer his view on China's growing pains as it continues to transform from a communist to capitalist colossus. Kissinger's appearance will be from noon to 2 p.m. at the Hyatt Regency Greenwich at a luncheon to support Family Centers Inc., a human services nonprofit with more than 30 programs in Fairfield County. Tickets start at $200 and single attendee and patron packages ranging from $1,000 to $15,000 include priority seating or access to a patron reception with Kissinger. Family Centers Inc. President Bob Arnold said Kissinger's lecture and his book "On China" will provide a timely perspective for the audience as the United States will face the challenge of working and competing with the Asian power's role in manufacturing and industry in the global economy. "We're delighted to have Dr. Kissinger," Arnold said. "His book is really a definitive work on China and certainly given the strategic relationship that the United States will have in the decades to come it is interesting for all of us to learn more about China and the Chinese people." Kissinger, 88, who was secretary of state from 1973 to 1977 during the administrations of U.S. presidents Richard Nixon and Gerald Ford, won the Nobel Peace Prize in 1973 for his efforts to establish a ceasefire and U.S. withdrawal from Vietnam. 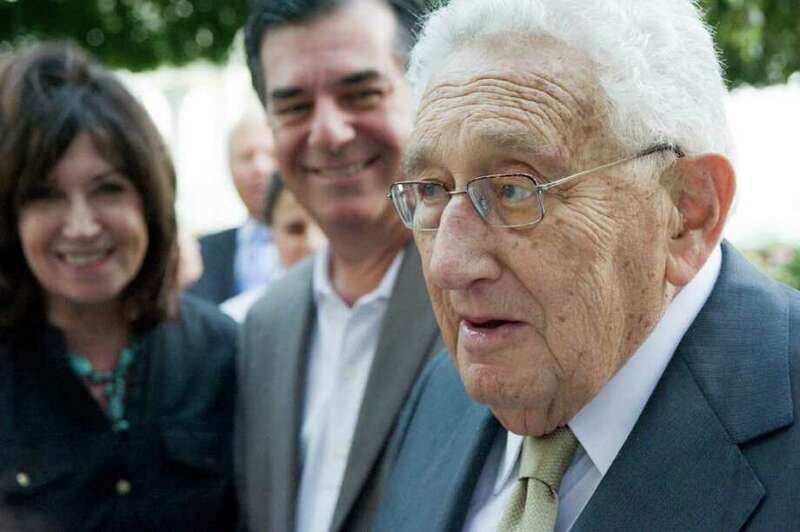 Kissinger spoke earlier this year to about 60 people at the Darien home of Robert and Jan Dilenschneider. The audience at that event included Gov. Dannel P. Malloy, Bridgeport Diocese Bishop William Lori, Stamford Mayor Michael Pavia, Greenwich First Selectman Peter Tesei and former WWE CEO and U.S Senate candidate Linda McMahon. "On China," published earlier this year, draws on Kissinger's experience during his diplomatic career, which included the United States' successful effort during Nixon's presidency to reopen diplomatic relations with the People's Republic of China. "We tend to think every problem has a solution in a short period of time," Kissinger said at the Darien event about the dialogue between the two countries. "For the Chinese, every issue is trench warfare. There are no little issues." Arnold said Family Centers aims to raise between $50,000 and $100,000 at the event, and about $3.5 million of its $11 million budget comes from donor contributions. In Stamford, Family Centers operates the city's school-based health clinics, as well as Stamford CARES, which offers case management, emergency financial assistance, and HIV medical care referrals to those living with HIV and AIDS. Among Family Centers programs are the Center for Hope, which provides support, counseling and other services to adults living with illness and bereavement support to their families, and the Den for Grieving Kids, which focuses on assisting children and teenagers in Fairfield and Westchester counties with counseling, including evening support groups to grapple with the loss of a family member. In December, Family Centers will hold its traditional countywide lighting of luminaries, which will raise funds for their services through the sale of luminary kits, Arnold said. The event also serves as a symbol of awareness and support for families coping with the illness or death of a loved one. "People light up luminaries in memory of people they have lost or who are ill, and it is a wonderful event," Arnold said. For information and tickets, visit www.familycenters.org or call 203-869-4848.